In the early 20th century American book collecting reached the peak of its popularity. Not coincidentally, A. Edward Newton wrote a number of inspirational books about books during this time, the most famous being The Amenities of Book Collecting (1918). The vast majority of inspired collectors were men. Women book collectors in fact have always been fairly rare. Did women—although heavy readers--just not collect books or were there barriers preventing them from participating at the highest levels? One contemporary woman collector was bold enough to express her feelings in print tinged heavily with frustration. Genevieve Earle’s essay described below first appeared in the August 1933 issue of Charles Heartman’s magazine, The American Book Collector. 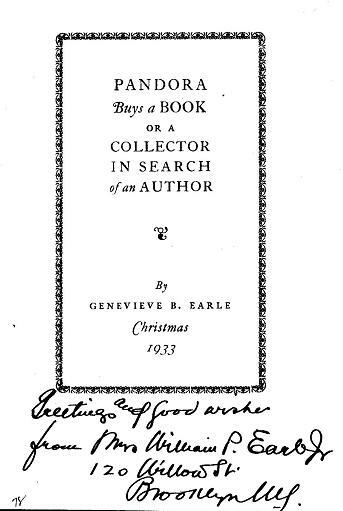 Earle published the essay separately in a now very scarce pamphlet as a Christmas greeting. The format was modeled after similar pamphlets issued yearly by A. Edward Newton. Genevieve B. Earle. 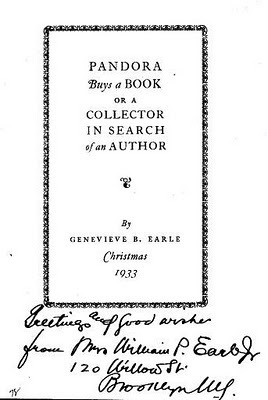 PANDORA BUYS A BOOK, OR A COLLECTOR IN SEARCH OF AN AUTHOR. N.p. : Christmas 1933. [ii] 15 p. 16mo. Light blue wrappers, printed paper label. Genevieve Earle’s book collecting frustrations went largely unheeded for decades. An exception was the Hroswitha Club, established in 1944 as a parallel organization to the Grolier Club for serious book women but membership remained small and segregated. However, things have evolved today and the once all-male clubs such as the Grolier Club, the Caxton Club, and others, have many active women members. In fact, the Grolier Club recently elected Carolyn Smith its first woman president (2002-2006). Smith is a collector of Churchill material. I’m sure Genevieve Earle now resides in Book Valhalla as all past dedicated collectors do, smiling in satisfaction at the turn of events as she hunts one more elusive tome. As for Eddie Newton, he appreciated women collectors like Genevieve Earle, Amy Lowell, Carolyn Wells, and his own daughter, Carolyn Newton, who inherited a spark of her father’s book collecting gene. 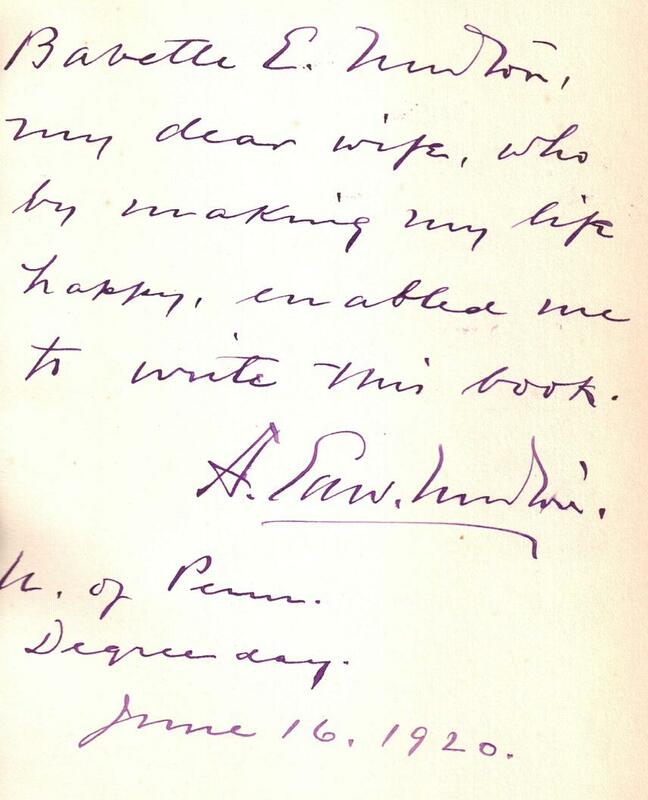 Newton also recognized the role his wife played in his collecting life and he dedicated to her The Amenities of Book Collecting: “If, as Eugene Field suggests, womenfolk are few in that part of paradise especially reserved for book-lovers I do not care. One woman will be there, for I shall insist that eight and twenty years probation entitles her to share my biblio-bliss above as he has shared it here below. 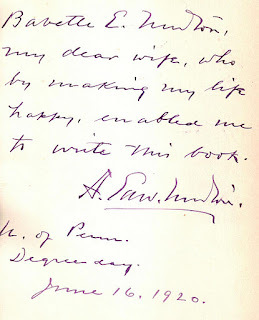 That woman is my wife.” The inscribed dedication copy is preserved in my own collection. It seems a curiously contradictory fact that, although Englishwomen are on the whole greater readers than men, they are, as book-collectors or bibliophiles, an almost unknown quantity. As famous women in business are growing and so are the collector.